This time of year can be a stressful and somewhat overwhelming time for everybody. Yet when dealing with both diabetes and an eating disorder, there can be a myriad of issues to deal with. DWED have compiled the following survival tips from knowledge of challenges we know our members have faced in the past and we hope they may be of use to more of you over the Christmas and New Year period. Remember, you are allowed to enjoy yourself and relax without having your disorder completely dictate. You deserve that even if your negative inner voice tells you otherwise. It’s easy to fret over present buying in the run up to Christmas day. You might be worried over what to get for whom and how much you can afford to spend. But as the saying goes it is always the thought that counts so try not to become too obsessive as your presence on the day should be valued most of all. The process of going out and braving crowds can also be hugely daunting. If you suffer from anxiety then it is best to rely upon online stores that offer everything and anything at the tap of a mouse with quick delivery. Try not to put yourself in vulnerable situations if you can avoid them. You may feel daunted by the expectations put on you to attend social occasions which put you into contact with new and unfamiliar people. They also usually involve food and alcohol. This can be understandably tough for someone with diabetes and an eating disorder as you don’t want to look awkward or strange. Try to be brave and push yourself out of your comfort zone if you can. New experiences and potential friendships can be a revelation when you might be used to existing in a bubble protected by your eating disorder. Do not feel forced to eat anything you are not happy to and take your own snacks if this will make you feel more at ease. If anyone pesters you or asks questions just say you have diabetes and they will usually leave you alone. Be cautious when it comes to alcohol if possible (obviously, often this can go out of the window, but still try to be as safe as you can). It is recommended that you reduce short acting insulin doses taken while drinking as alcohol, especially wine, can often cause sugar level crashes later on. It is always wise to eat something with carbohydrate both prior and after you have been drinking. Crucial one from the type 1 diabetes rule book: Make sure you have enough supplies. There’s nothing worse than realising you don’t have test strips or enough needles when all GP surgeries and pharmacies are closed. If you wear a pump then make sure to order plenty of equipment s to last you through, as well as spares in case any malfunctions occur. Speak up and let people know how they can help you prepare, especially with regards to dietary specifications. Being aware of what to expect will hopefully help you to feel more at ease. Finding a balance between restricting and binging when food is in abundance might be particularly difficult so try not to give your eating disorder room to run riot. Discussing what you will eat and what portions you can manage in advance with people that are around can be hugely worthwhile if it enables them to be more mindful. Being served a plateful of food that feels completely unsafe by someone that is completely unaware as to how this may affect you can be disastrous. You may be tempted to isolate and keep concerns to yourself when you fear lack of control over the situation but this will only create tension and leave you feeling miserable. Instead, make sure you create an open and honest dialogue. Do try to allow yourself some treats but not to the point where you may feel tempted to manipulate insulin or compensate in some other way. It’s not worth pushing yourself to a limit where you are at risk of falling over the edge. Don’t put too much demand on yourself to be perfect and think of the Christmas meal as any other meal. Furthermore, avoid the scales before, during and after Christmas if you can manage to. It may be extremely difficult to comprehend but ultimately the measure of your weight does not matter and isn’t wort any consideration. Family relations can be problematic and being around your relatives and loved ones constantly can feel like too much. It is normal to bicker and disagree but full scale arguments can be distressing, especially if they are centred on your struggles with food. To avoid feeling caged in or uncomfortable make sure to take moments out and distract yourself; go for a walk, watch rubbish Christmas TV, or write down your feelings. Talk to friends on the phone or online. Don’t give yourself the opportunity to fixate on food. Your professional health care providers should also be at hand to provide guidance if you are particularly struggling. If you are receiving treatment from ha health care professional you feel you can talk to then try to request an appointment with them just prior to the festive season. This could be your diabetic nurse, GP, eating disorder nurse, therapist or psychiatrist if you see one. 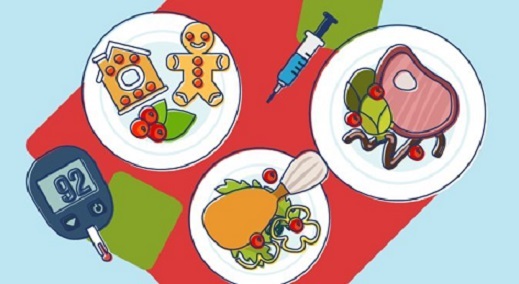 Additionally some eating disorder units offer group therapy sessions to outpatients that are focused on Christmas so this may be a resource that is available to you. Local peer support groups are also run by charities such as Beat (https://www.b-eat.co.uk/) and Mind (http://www.mind.org.uk/ ). For peer support for other people struggling with type 1 diabetes and eating disorders please feel welcome to join and post in our facebook support forum. Visit https://www.facebook.com/groups/T1EDUK/ for comraderie and understating. Alternatively if you are a freidn, family or carer to someone with T1ED looking to talk to others that may be in similar situations then consider joining https://www.facebook.com/groups/T1EDFFCsupport/. Keep reminding yourself that it’s supposed the season of goodwill to all (including you), so cut yourself some slack. Be less self critical and also give yourself credit for the things you achieve. When it’s all over, the wrapping paper is cleared away and the tree is taken down, recognise the fact that you got through it. New Year can provide the motivation and opportunity to make changes and start afresh. You do not have to suffer alone. If you need a listening ear there is always somewhere to turn. Beat’s helplines are open 4pm until 10pm seven days a week, and from 4pm until 8pm on Christmas Day, Boxing Day, and New Year’s Day. Contact their under-18s helpline on 0345 634 7650 or the adult helpline on 0345 634 1414. Diabetes UK’s helpline is open 9am-5pm at 0345 123 2399 or 0141 212 8710 if you are in Scotland. The Samaritans are also open 24 hours a day, 7 days a week over the Christmas period. You can call them on 08457 90 90 90. In the case of a medical emergency or if feeling at risk of serious self harm then please reach out and call NHS 111 or visit your nearest accident and emergency department. Republished and refreshed from 2016 version.